This article is about the Babylonian leader. For other uses, see Belshazzar (disambiguation). Not to be confused with Belteshazzar. Belshazzar (/bɛlˈʃæzər/; Hebrew: בֵּלְשַׁאצַּר, Belshatsar, Greek: Βαλτάζαρ, Baltázar, from Akkadian: 𒂗𒈗𒋀, Bēl-šar-uṣur, meaning "Bel protect the king") was the eldest son of Nabonidus, the last king of the Neo-Babylonian empire, and regent for his father during the latter's prolonged absence from the city, although he never assumed the titles or ritual functions of kingship. He may have been killed when Babylon fell to the Persians in 539 BCE. 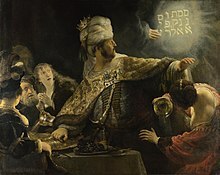 Rembrandt's depiction of the biblical account of Belshazzar seeing "the writing on the wall"
Belshazzar also appears as a central character in the story of Belshazzar's feast in the Book of Daniel, recognized by scholars as a work of historical fiction. Daniel's Belshazzar is not malevolent (he rewards Daniel for his interpretation of the writing), but in later Jewish tradition he is presented as a tyrant who oppresses the Jewish people. The most important sources for the time of Belshazzar are the Nabonidus Chronicle, the Cyrus Cylinder, and the Verse Account of Nabonidus—which, despite its name, was commissioned by the Persian conqueror Cyrus the Great. Belshazzar was the son of Nabonidus, the last king of the Neo-Babylonian Empire. The Nabonidus Chronicle describes him as a grandson of Nebuchadnezzar, but this may have been propaganda to justify the reign of his father, who was not of the royal line. He played a pivotal role in the coup d'etat that overthrew King Labashi-Marduk and brought Nabonidus to power in 556 BCE, although unlike his co-conspirators he was not a member of the old Babylonian aristocracy. Nabonidus spent the years c.553-543 BCE in the oasis of Teima in the northern areas of the Arabian Peninsula, leaving Belshazzar to govern Babylon. During his father's prolonged absence Belshazzar ruled as regent or co-regent, but was never called King and never took part in the Babylonian New Year Festival, at which the king's presence was essential. His duties as Crown Prince (the title that appears in documents) included overseeing temple estates and leasing out temple land, and he worked at restoring the Babylonian god Marduk, demoted by Nabonidus in favor of the moon god Sin. Nabonidus returned to Babylon about 543 BCE, and the status of Belshazzar thereafter is unclear. The king's return may have been connected with the increasing threat posed by the Persian conqueror Cyrus the Great, who ruled a huge empire to the north and east of Babylon. Open hostilities commenced in late 539 BCE, and on 12 October "Ugbaru, governor of the district of Gutium, and the army of Cyrus entered Babylon without a battle" (Babylonian Chronicle)—this is presumably the same individual as Gobryas, a Babylonian provincial governor who switched to the Persian side, mentioned by the Greek historian Xenophon. Nabonidus was captured and his life apparently spared, but Belshazzar may have died during the fall of the city. In the Book of Daniel, Belshazzar plays a significant role in the tale of Belshazzar's feast, a variation on the story of Nebuchadnezzar's madness showing what happens when a gentile king does not repent. During a feast, Babylonians eat and drink from the holy vessels of Yahweh's temple, and "king" Belshazzar sees a hand writing the words mene, mene, tekel, upharsin on a wall. Daniel interprets the writing as a judgment from Yahweh, the god of Israel, foretelling the fall of Babylon. Daniel tells Belshazzar that because he has not given honor to God, his kingdom will be given to the Medes and Persians. Belshazzar is killed that night, and Darius the Mede takes the kingdom. The Book of Daniel was compiled shortly after 164 BCE, following the Maccabean Revolt. The story of Belshazzar's feast is historical fiction, and several details are not consistent with historical facts. Belshazzar is portrayed as the king of Babylon and "son" of Nebuchadnezzar, though he was actually the son of Nabonidus—one of Nebuchadnezzar's successors—and he never became king in his own right. In the story, the conqueror who inherits Babylon is Darius the Mede, but no such individual is known to history, and the invaders were actually Persians. This is typical of the "tale of court contest" in which historical accuracy is not an essential element. In the Book of Daniel, Belshazzar is not malevolent (he rewards Daniel and raises him to high office). The later authors of the Talmud and the Midrash emphasize his tyrannous oppression of his Jewish subjects, with several passages in the Prophets interpreted as referring to him and his predecessors. For example, in the passage, "As if a man did flee from a lion, and a bear met him" (Amos 5:19), the lion is said to represent Nebuchadnezzar, and the bear, equally ferocious if not equally courageous, is Belshazzar. The Babylonian kings are often mentioned together as forming a succession of impious and tyrannical monarchs who oppressed Israel and were therefore foredoomed to disgrace and destruction. Isaiah 14:22, "And I will rise up against them, saith the Lord of hosts, and cut off from Babylon name and remnant and son and grandchild, saith the Lord," is applied to the trio: "Name" to Nebuchadnezzar, "remnant" to Amel-Marduk, "son" to Belshazzar, and "grandchild" Vashti (ib.). The command given to Abraham to cut in pieces three heifers (Genesis 15:9) as a part of the covenant established between him and his God, was thus elucidated as symbolizing Babylonia, which gave rise to three kings, Nebuchadnezzar, Amel-Marduk, and Belshazzar, whose doom is prefigured by this act of "cutting to pieces" (Midrash Genesis Rabbah xliv.). The Midrash literature enters into the details of Belshazzar's death. Thus the later tradition states that Cyrus and Darius were employed as doorkeepers of the royal palace. Belshazzar, being greatly alarmed at the mysterious handwriting on the wall, and apprehending that someone in disguise might enter the palace with murderous intent, ordered his doorkeepers to behead anyone who attempted to force an entrance that night, even though such person should claim to be the king himself. Belshazzar, overcome by sickness, left the palace unobserved during the night through a rear exit. On his return the doorkeepers refused to admit him. In vain did he plead that he was the king. They said, "Has not the king ordered us to put to death any one who attempts to enter the palace, though he claim to be the king himself?" Suiting the action to the word, Cyrus and Darius grasped a heavy ornament forming part of a candelabrum, and with it shattered the skull of their royal master (Shir ha-Shirim Rabbah 3:4). ^ Dougherty 1929, p. 43. ^ a b c d Chavalas 2000, p. 164. ^ Seow 2003, p. 76. ^ Albertz 2003, p. 69. ^ Collins 1984, p. 41. ^ a b Laughlin 1990, p. 95. ^ a b c Seow 2003, pp. 4–6. ^ a b Collins 2002, p. 2. ^ a b Seow 2003, p. 7. ^ a b Waters 2014, p. 43. ^ Briant 2002, p. 32. ^ Albertz 2003, p. 63. ^ Henze 1999, p. 61. ^ a b Briant 2002, p. 41-42. ^ Newsom & Breed 2014, p. 164. ^ Albertz 2003, p. 69-70. ^ Collins 1984, p. 70. ^ a b Seow 2003, pp. 75. ^ Collins 1984, p. 67. ^ Albertz 2003, pp. 18-19. ^ Collins 1984, p. 41,67. Singer, Isidore; et al., eds. (1901–1906). "Belshazzar". The Jewish Encyclopedia. New York: Funk & Wagnalls. Albertz, Rainer (2003). Israel in Exile: The History and Literature of the Sixth Century B.C.E. Society of Biblical Literature. ISBN 9781589830554. Briant, Pierre (2002). From Cyrus to Alexander: A History of the Persian Empire. Eisenbrauns. ISBN 9781575061207. Chavalas, Mark W. (2000). "Belshazzar". In Freedman, David Noel; Myers, Allen C. (eds.). Eerdmans Dictionary of the Bible. Eerdmans. ISBN 9789053565032. Collins, John J. (1984). Daniel: With an Introduction to Apocalyptic Literature. Eerdmans. ISBN 9780802800206. Collins, John J. (2002). "Current Issues in the Study of Daniel". In Collins, John J.; Flint, Peter W.; VanEpps, Cameron (eds.). The Book of Daniel: Composition and Reception. I. BRILL. ISBN 978-0391041271. Dougherty, Raymond Philip (1929). Nabonidus and Belshazzar. Wipf and Stock Publishers (2008 reprint). ISBN 9781556359569. Henze, M.H. (1999). The Madness of King Nebuchadnezzar. Eisenbrauns. ISBN 978-9004114210. Laughlin, John C. (1990). "Belshazzar". In Mills, Watson E.; Bullard, Roger Aubrey (eds.). Mercer Dictionary of the Bible. Mercer University Press. ISBN 9780865543737. Newsom, Carol A.; Breed, Brennan W. (2014). Daniel: A Commentary. Presbyterian Publishing Corp. ISBN 9780664220808. Seow, C.L. (2003). Daniel. Westminster John Knox Press. ISBN 9780664256753. Waters, Matt (2014). Ancient Persia: A Concise History of the Achaemenid Empire, 550–330 BCE. Cambridge University Press. ISBN 9781107652729. This article incorporates text from a publication now in the public domain: Singer, Isidore; et al., eds. (1901–1906). "Belshazzar". The Jewish Encyclopedia. New York: Funk & Wagnalls.